Millie Bobby Brown admitted she was a Flat Earther during a live stream and the video has spread like wildfire – but not for the reason you might think. 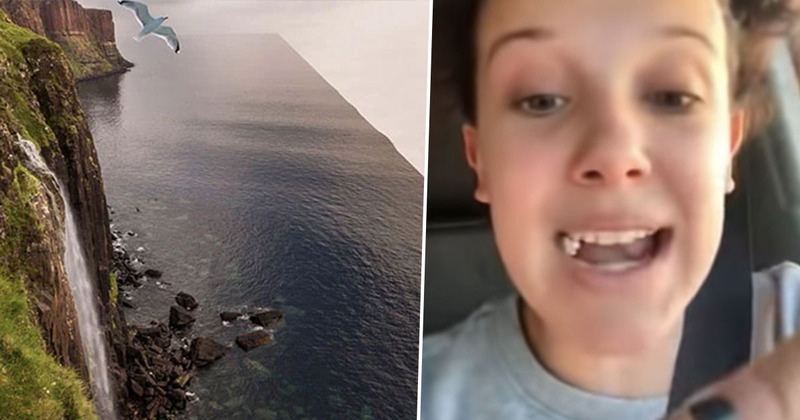 Often intricate theories ‘proving’ Earth is flat go viral even if they come from your average Joe Flat Earther, so as soon as someone with 18 million Instagram followers preaches belief, it’s bound to break the internet. But in this particular video, it isn’t Millie’s declaration of herself as a Flat Earther that caused the video to go viral. It was the sudden and unexplained singing that occurred afterwards. Let’s just deal with this one step at a time. Before we get too carried away questioning why the Stranger Things star thinks the Earth is flat, let’s remember that she’s only 14. I got caught up in a lot of conspiracy theories when I was younger – though they were usually more to do with the Illuminati than disputing everything I’d learned in my science lessons. It’s also quite unfortunate the video was a live stream. If she’d pre-recorded, Millie might have had a chance to re-watch her video and really consider if she really wanted to declare herself a Flat Earther, but in broadcasting unfiltered there was just no turning back. The actor was answering a question from a fan when she made her revelation, as she read “do you think the planet is flat?” before gasping and launching in to her answer. We were watching a conspiracy theory the other night and let me tell you. Guys there are so many facts that it’s flat. I mean, think about it. Like think about it. I mean, guys, you don’t even know. I think I am a … Flat Earther. Millie didn’t actually explain what any of these “many facts” were, a convenient Flat Earther trope, but they were obviously enough to convince her in the same way they’ve convinced all the other members of the Flat Earth Society. While hopefully most people will form their own opinions, or you know pick up a book and read established facts, about the shape of the world, I do worry about Millie’s younger, more impressionable followers. We could have a Flat Earther epidemic on our hands. The 14-year-old explained she’d been convinced of the theory after watching a video by YouTuber Shane Dawson. In a conversation with his brother, Shane learns there are all sorts of considerations that go into believing the Earth is flat. They touch on the information we learn from NASA regarding pictures of our planet and the moon landing, the definition of the word ‘theory’ in relation to the Big Bang theory and the theory of gravity, and references found in religion. The video offers a range of ‘evidence’, but while it might convince a few curious viewers like Millie, I don’t think it will be enough to make all of the Round Earthers out there suddenly change their opinions. That video of Millie Bobby Brown saying she’s a flat earth believer and then abruptly breaking into song I- I just have so many questions. It seems like Millie is just in her own little world – whether that be a round or a flat one. At least she seemed to be enjoying herself.